If your winter heating bills were higher than expected, there may be areas for improvement in your home's energy envelope. And if it cost more to heat your home this winter, it might cost more to keep it cool when summer arrives. The U.S. Department of Energy (DOE) has outlined a number of steps every homeowner can take to improve energy efficiency by conducting a home energy audit. The first step is to locate and seal air leaks. In the winter, drafts are not just costly but reduce the comfort level. The most likely places to find air leaks are along the baseboard or edge of the flooring and where the walls meet the ceiling. Cracks around doors and windows are another source of energy loss. You may also find leaks around light and plumbing fixtures and electrical outlets. DOE estimates plugging these leaks can not only make a home more comfortable, but trim up to 20% off annual energy bills. The next step is to check your home's insulation. Houses built over the last 20 years are generally pretty energy efficient, but homes built before the 1980s may have skimped on insulation. If you have an attic hatch or pull-down steps, this could be one area where energy is escaping. Check to make sure the opening has as much insulation as the rest of the attic and that there are no gaps around the opening. Installing thick weatherstripping can close most gaps, but hinges and springs may need adjustment to ensure a tighter fit when the attic access is closed. Furnaces and air conditions are big energy users, since both are appliances that are on many hours of the day to control the interior temperature of your home. Besides plugging leaks, you can save money by making sure that when they do run, they are operating at peak efficiency. Filters need to be checked and replaced on a regular basis. The burners on gas and oil furnaces need regular cleaning so they aren't wasting fuel. If a furnace, air conditioner or heat pump is old and prone to periodic breakdowns, consider replacing it instead of repairing it. New units will be much more efficient. After conducting an energy audit, DOE suggests making a whole house energy plan. Total up your annual spending on home energy and pinpoint areas where you think costs can be reduced. The plan should also made a judgment on the cost effectiveness of remedies. Determine the payback on installing triple-pane windows as opposed to plugging holes with caulk. 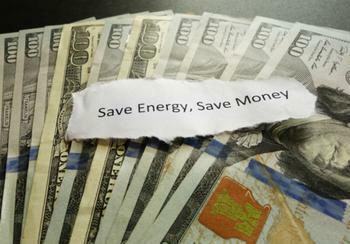 DOE has more energy-saving ideas here.